The published figures for the cost of litigation in the NHS are not related to the problem the Saatchi Bill claims to solve. Patients may still be able to sue for bad practice, but post-Saatchi they would have to fight the Bill before they can fight their claim, which would be more expensive, more complex, and more unfair on patients that have genuinely been harmed. The treatments that are most likely to harm patients would perversely be the ones where patients are least protected, and where they would find it hardest to sue if they were indeed harmed. When the Department of Health produced its initial consultation document for the Medical Innovation Bill (the Saatchi Bill), they included a graph that showed the rising cost of clinical negligence payments made by the NHS over the past few years (about £1.24bn in 2012/3). They did not include any analysis to show what proportion of that sum covered straightforward negligence (leaving a swab inside a patient post-op, amputating the wrong limb, giving the wrong dose of a drug, that sort of thing) and what proportion was from situations where doctors had innovated, and then were later sued. This is a shame, because knowing the true cost of litigation due to innovation would have been an important piece of evidence to justify the Bill. Also, there would be a risk that the casual observer might not realise that most — perhaps all — litigation is because of claimed poor practice, not for innovation, and accidentally draw a link between that £1.24bn sum and the risk of innovating doctors being sued. That casual observer might mistakenly use this as a reason to think the Bill is a good idea. But of course the Saatchi Bill team aren’t casual observers, and they wouldn’t draw that link themse- oh no, wait, that’s exactly the link they drew. But we really need to know if any of this amount actually relates to innovation, otherwise we don’t know if the Bill can do anything to reduce it. The DoH consultation document wasn’t forthcoming on this point, so presumably the Saatchi Bill campaign can provide some evidence? Er, no. All we have from the Saatchi campaign are anecdotes such as this from Lord Woolf, where he recalls hearing cases of doctors being sued for negligence. Unfortunately, that particular anecdote has been eviscerated in Solicitors Journal after Lord Woolf admitted he couldn’t actually name any such case. Certainly we’ve had no figures at all from the Saatchi campaign. So what about the people who actually deal with litigation against doctors, those who act for patients, those who defend the doctors or regulate them? What about patient or research organisations? There we have a much clearer answer. The Medical Protection Society, the Medical Defence Union, The British Medical Association and the Academy of Royal Medical Colleges, The NHS Litigation Authority and the Medical Research Council, Cancer Research UK and many other organisations have not found any cases of litigation arising from innovation. If the organisations that represent doctors when they are sued cannot find any case of doctors being sued for innovating, then one has to question whether there has actually ever been one. The area of cost targeted by the Bill for cost reduction currently costs the NHS £0.00 a year. I may not be going too far out on a limb if I suggest that there doesn’t appear to be much scope to reduce that figure. Now, if we were applying the same sort of intellectual rigour and simplistic PR grandstanding that has typified the Saatchi Bill campaign, we could stop here and consider our job done. The Bill is going to make no difference to the cost to the NHS of litigation. But, as Ben Goldacre would interject around about now, I think you’ll find it’s a bit more complicated than that. I suspect that there will actually be effects on the cost of litigation, alongside profound effects on the ability of patients to sue when they feel they have been harmed, so I’d like to look now at both those things in parallel. The Saatchi campaign has been — shall we say — contradictory in its presentation of the effect the Bill will have on the ability of patients to sue for negligence. While claiming it doesn’t alter patients’ ability to sue, promoters also say that it protects doctors from being sued. I’ve already examined that in some detail here, so now I’ll look at what might happen in a negligence claim and how the Bill appears to distort it. Here’s a diagram representing all treatments currently protected under law, that is, treatments that would pass Bolam/Bolitho. All the treatments are open to being challenged in court. Incidentally, the bar for succeeding in a negligence claim is currently quite high; you need to have a strong case to succeed. At this point, we clearly need to define what distinguishes innovative treatments from established ones. Unfortunately, the Bill is rather vague on this but, given that articles placed in the press by the Bill team have talked about wanting the ability to prescribe “off-label” (drugs that are not specifically licensed for that particular use), I’m going to include this under the definition of “innovative” treatment for the purposes of this illustration. Incidentally, this would include most prescribing for children. So Category A is an established treatment, and Category B is an innovative one. To help illustrate the Bill, I’m going to introduce at this point two fictional patients, Mr E and Miss T.
Mr E has been diagnosed with a rare tumour. This disease has a poor prognosis. He could be offered an established conventional treatment and fall into Category A or perhaps there is a clinical trial of a new therapy he could join in Category B. Miss T is a child with chronic asthma, and is currently being treated with a drug that has been trialled and shown to be effective in adults. No trial has been done in children, but there is good reason to believe that it would be fine for this use, and so the doctor prescribes it. Miss T would therefore fall into Category B. For both patients, their doctors would have a strong defence against any possible litigation for the choice of treatment given. They could only really be sued for incompetent treatment (wrong doses of drugs, for example). Now, what the Saatchi Bill seeks to do is add a new category, which I will call Category S.
This category covers treatments that would fall outside Bolam/Bolitho — treatments that have no support from colleagues and/or no logical basis for why they would work. If a doctor proposes a treatment that has support from a responsible body of colleagues and a logical basis, they have no need of the Bill — their proposed treatment would be Category B. No, this new category covers treatments that have no support or logical basis, because that is what the Bill aims to allow. Note that this new category of treatment cannot be challenged in court. 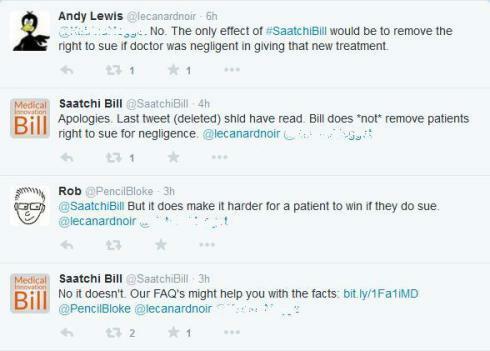 As long as the treatment falls under the Saatchi Bill’s provisions, the actual treatment itself can’t be questioned. So we are left in the odd situation that the treatment decision with the lowest supporting evidence, the lowest standard of diligence required from the doctor and the highest risk of harming the patient has the highest protection for the doctor and the lowest protection for the patient. The doctor could still be sued for delivering the treatment badly, but this may be much harder. We’ll use Mr E to demonstrate why. Mr E has heard about a revolutionary treatment, which uses a chemotherapy drug extracted from urine called Emerson-LakeandPlastons (ELP) (my audience will realise that my choice of example here is entirely fictitious) and has an anecdotally-claimed high success rate, though no published results. Under current law, a doctor delivering such a treatment in the UK may be subject to a negligence action if the treatment causes harm. Under the Saatchi Bill, the doctor could provide this treatment (which would fall into Category S on the chart), and enjoy the protection of the Bill. Now, ELP has some pretty strong potential side effects — seizures, coma, paralysis, even death, so it needs to be monitored carefully, because an overdose can have serious repercussions. Mr E has just such an overdose, which results in serious, permanent impairment. Mr E believes this is because the doctor didn’t monitor his medication competently, and he sues to recoup the cost of the permanent round-the-clock care he now needs. So in order to succeed in a negligence claim, the patient would have to show a reason why the Saatchi Bill didn’t apply, and only then could they proceed to a claim under Bolam/Bolitho. This would clearly be more complex and difficult than it would have been without the Saatchi Bill. If this happens, much of the innovative treatment previously covered under Bolam/Bolitho moves to Saatchi (Category S). In the process, these patients lose their ability to gain redress if something goes wrong. We now effectively have a two-tier system of protection, where the level of protection afforded to the patient is determined by the doctor’s whim, and the most dangerous treatments offer the least protection. Returning to the story of Miss T, her doctor says that, due to new regulations, her mother has to sign a treatment consent form to continue to have her asthma medication. Having agreed to the treatment, they can no longer sue for negligence if anything goes wrong with Miss T’s treatment. While any new Saatchi treatments will undoubtedly add litigation costs, because they relate to treatments that are only being attempted because of the existence of the Bill to protect them, the picture for any existing treatments that move across to Saatchi is less clear. I have to concede a possibility here: these Category B treatments moving to Category S may result in some reduced costs. To take an example, a patient who would previously have sued for bad treatment may, after it has been Saatchi-ised, be deterred from pursuing that claim, even if it is for bad practice rather than unsupportable treatment choice. It’s arguable whether this is fair; a genuinely-wronged patient may be unfairly inhibited from seeking redress. But on the flip side, any claims that do go ahead are going to be more complex for the reasons I’ve already stated: they’ll have to attack the Saatchi status first, and then go on to Bolam/Bolitho. So would the decreased cost of potentially fewer cases going ahead after they’ve migrated to Saatchi protection outweigh the increased cost of those cases that do go ahead? Or vice versa? Or will they balance out? I don’t know. But the point is, neither do the Saatchi team. They’ve not troubled to investigate this or indeed do any research, so nobody has any idea whether costs will go up or down. But we should all now clearly see some things about litigation and cost. The headline figures for the costs of litigation in the NHS are not related to the problem the Saatchi Bill claims to solve. NB: This post, as much as any I have written, highlights that I am not a lawyer. There may be huge errors in my reasoning that any legally-trained professional could spot in an instant. If you do spot any such errors, I would be grateful if you could point them out in the comments. I would like to be shown that I’m wrong because if it turns out that what I have written above is sound, we should all be very, very worried. Shall we just say that I shall take full account of the views of one or more experts in the field in a way that any responsible writer would be expected to take account of such views?